This software contains detailed modelling of the single photon response, the quantum bump, of fly photoreceptors. All known components participating in the primary phototransduction process are taken into account, and estimates are given for both the physical and chemical parameters. Both deterministic and stochastic simulations of the photoinduced current are possible using the same software. The code was implemented in Matlab and stored at the Imperial College London repository. It includes a GUI which offers an easy access and manipulation of the input parameters and therefore allows for simulations for a vast number of interesting possibilities, such as various mutants, different ionic concentrations, etc. Explanations for all the equations and parameters used are given in ref. 1. The software was produced as a part of our efforts to understand the dynamics of the photo-sensing processes in invertebrates which created a very sophisticated and powerful signal transduction mechanism with high quantum efficiecy, huge signal amplification, fast recovery, and adaptation to 10 orders of magnitude of the input intensities, see ref. , . This mechanism allows biological organisms to be able to detect a single photon in a noisy environment. Essentially the mechanism is a G-protein coupled cascade, which has a photon as an input and a transmembrane current (the “quantum bump”) as an output signal, which causes a change in the intracellular potential. The model successfully reproduces the experimental results for the statistical features of quantum bumps (average shape, peak current average value and variance, the latency distribution, etc), as well as some particular cases such as arrestin mutant behaviour, low extracellular Ca2+ cases, etc. The phototransduction process (shown in Fig. 1) starts with activation of a Rhodopsin complex (R) due to photon absorption, then several G-proteins are split to create Ga-GTP subunits (G*), which activate a Phospholipase C (PLC) molecule and they hydrolyse PIP2 to diacyl glycerol (DAG). DAG causes the opening of the Transient Receptor Potential (TRP) ion channels. The TRP ion channels regulate the ionic current in/out of the cell (including Ca influx), and finally Ca regulates positive and negative feedbacks. The TRP channel activity was modelled using the Monod-Wyman-Changeux (MWC) theory for allosteric interaction. The mathematical model consists of a set of rate equations which describe the time evolution of all products shown in Fig. 1. The software can combine deterministic and stochastic approaches and allows for a detailed noise analysis. 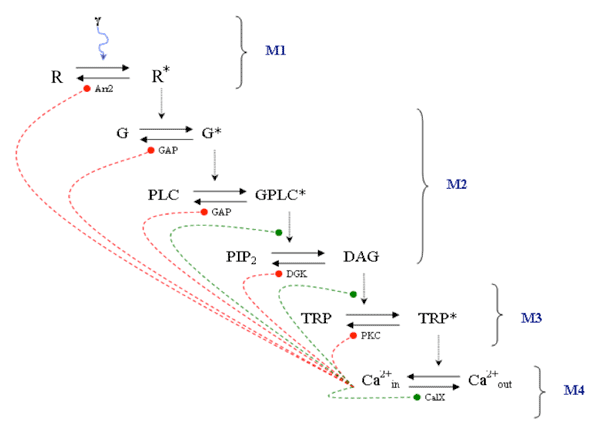 A schematic representation of the phototransduction cascade separated into modules and showing the positive (red) and negative (blue lines) feedbacks. The computational model was coded in Matlab using the Parallel Computing Toolbox, which allows computations on multicore computers and computer clusters. The main file is "Drosophila_Phototransduction.m" which when called it opens the GUI, shown in Fig. 2. An appropriate graphic user interface was developed which gives very convenient and instructive presentation of the parameters used in the modelling and could easily be expanded to other G-protein coupled cascade processes. The GUI contains the preloaded values for parameters and should be mostly self-explanatory in combination with the paper . It is possible to run stochastic or deterministic models (Calculation mode box) for single and multiple runs. The output consists of a table for some average values and three graphs (for the average quantum bump, latency time distribution and peak current distribution). An example of output results is shown in Fig. 3. It is possible to produce some other plots currently commented out in gui_averageQBall.m and gui_singleQB_multi.m files. GUI designed for running the simulation software. 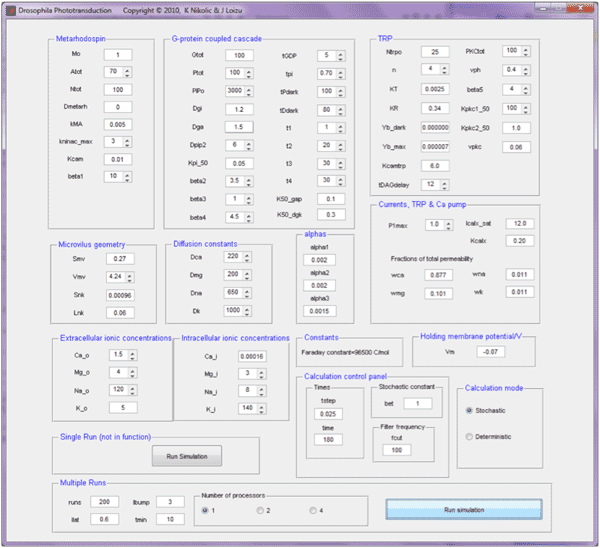 Contains all main parameters and details about the simulation execution. Output Results for the example of the Input parameters shown in Fig. 2. (A) The average quantum bump for aligned QBs for: experimental 79 QBs (data obtained from R. C. Hardie, University of Cambridge, shown by red circles) and the model fit for a set of 178 QBs (line), produced for 200 light flashes. QB events were filtered (100 Hz), aligned and averaged (see text). (B) Latency distribution for the onset of QB events (total of 178 QBs). (C) the peak current distribution. Note: 200 runs might take about one hour on a HP ZX800 workstation. Since each run produces a stochastic event although average values are shown here in any specific repeat of this programme slightly different results might be expected. It is possible to include or exclude the noise for each individual module of the cascade independently by using the variable flagM/G/P/D/T: to set deterministic mode (0) or stochastic mode (1). This allows understanding how signal is nonlinearly amplified. In the stochastic mode single photon absorption responses (or “quantum bumps” – QBs)are filtered with a low pass filter (see GUI, box “Filter Frequency”). Averaging: QBs aligned by their half bump rise and fall times as in S. R. Henderson, et. al, J. Physiol. 524, 2000, pp. 179–194. The aim regarding quality control for this simulator was to reasonably accurately reproduce experimental results, such as those given in the reference . Testing has been done on the Matlab platform. All operating systems where Matlab is operational. Aleksandar Nikolic – created the GUI. In general this software is an insightful tool to explore the properties and underlying mechanisms of the phototransduction cascade. Its flexibility easily allows for various extensions like more modules or mutant cases. The same model can be used for multiphoton response, i.e. in the case of higher light intensity stimuli. The biological process modelled here, which is a G-protein coupled cascade, represents a ubiquitous cellular mechanism which is present in many sensory pathways. Hence this software, with some small modifications, can be used for modelling other sensory channels, such as smell, vision in other species, hearing, touch and taste. Furthermore, this software could be used in investigations of the noise properties of enzymatic cascades , . The phototransduction process is able to suppress molecular noise to some extent, however sometimes it is possible to utilise noise for the sake of enhanced performance through the process of stochastic resonance. In our model it is possible to selectively and independently switch noise on and off, i.e. choose between deterministic and stochastic calculations for each step. In that way the role of different modules can be individually investigated and how its noise properties are affecting the signalling process, as well as the information coding . The software could be particularly useful for the wide research community of the Transient Receptor Potential (TRP) ion-channel family. It employs the Monod-Wyman-Changeux (MWC) model for allosteric interaction  which gives a high level of accuracy in describing kinetics of these complexes. TRP channels are present in a number of animal and human cells and have important role in many sensory pathways, such as those involved in sensation of pain, vision, smell, taste, pressure, temperature, etc . Computational simulations would allow theoretical investigations of a number of potential physiological and pharmacological experiments, which might be increasingly relevant due to TRP channels emerging roles in a number of diseases. The model developed here uses about 30 parameters which can be found in the open literature and another ~30 parameters are determined through fitting processes using experimental results. Identifying the possible values for some of the parameters could be important in elucidating some biochemical processes. For example the parameters concerning the TRP channels can give some insights into the nature and energetics of these proteins. In fact, the MWC model provides a thermodynamic interpretation which allows measuring of the free energy change for the allosteric transition (opening and closing). In Nikolic et al. 2012  was given an example of the free energy change for the opening of the unliganded channel as well as the change of the binding strength due to the allosteric transitions.This aspect could also be of interest in better understanding of the recently discovered photomechanical mechanisms in Drosophila photoreceptor membranes . Generally speaking this software offers a number of possibilities for reuse as a tool in system modelling of biochemical processes which are relevant for bio-inspired electronic designs . For example it is a useful meta-design tool for mimicking biological systems in designing new technologies for signal sensing and amplification which would exceed the capabilities of conventional technologies in some key metrics, such as sensitivity, latency and dynamic range. Eventually, this software is a useful demonstrator of a very rich dynamics which exists at a very basic level of biochemical molecular machinery (e.g. see Hardie 2012 ). Although seemingly simple, it provides mechanisms such as negative and positive feedbacks, “dark current” noise suppression, adaptation to a huge dynamic range of inputs etc, which lie at the core of the self-organised, life processes. The authors thank Dr Patrick Degenaar (Newcastle University) and Prof Chris Toumazou (Imperial College London) for their support of this project. Monod, J, Wyman, J and Changeux, J-P (1965). On the nature of allosteric transitions: a plausible model. Journal of Molecular Biology 12: 88–118.